Leeches were a constant threat in the rainforest. We got fairly good repellent results for terrestrial leeches by liberally applying mosquito repellent on our boots, ankles, and pants legs. The leeches on the vegetation and shrubery on the trail sides were another issue. 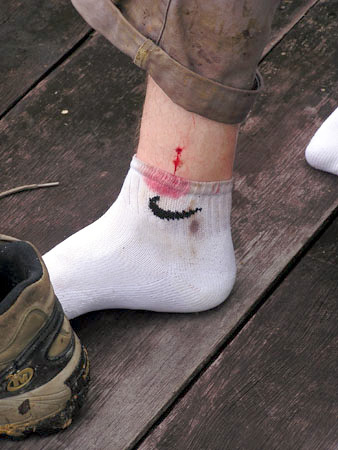 This image shows the after effects of a leech attack.